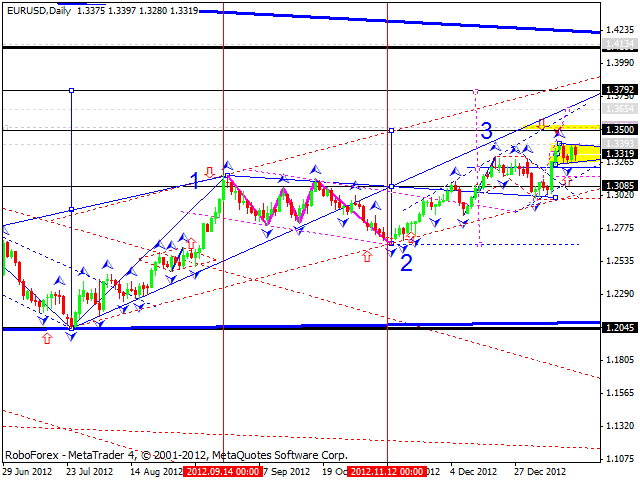 At the daily chart the EUR/USD currency pair continues forming the third ascending wave with the target at 1.3500. Right now the market is consolidating inside a narrowing trading range and forming triangle pattern. I think this week the price may break this range upwards and reach the above-mentioned target. Later, in my opinion, the pair may form a pivot point to start a correction towards the level of 1.3080. At the daily chart the GBP/USD currency pair continues falling down towards the level of 1.5790. The structure of this movement may be considered as a three-wave pattern. Later, in my opinion, the pair may form a pivot point to continue growing up and forming the fifth wave. The target is at the level of 1.6400. 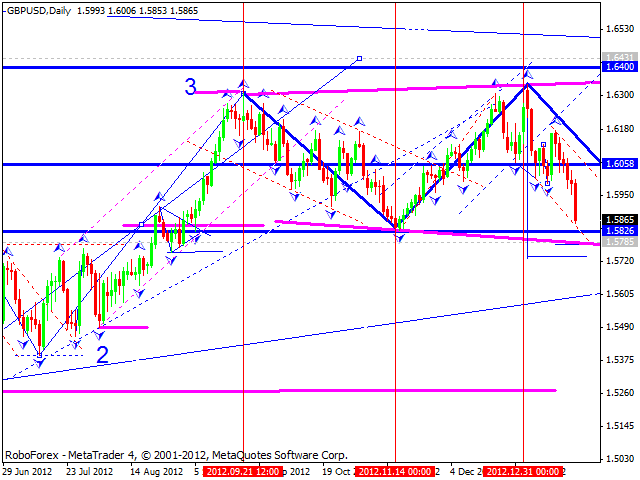 At the daily chart the USD/CHF currency pair is weakening; the structure of the last wave is a five-wave one. At the moment the market is forming a consolidation pattern between the levels of 0.9385 ‑ 0.9285. If the price break this channel upwards, the wave may be expanded and reach the target at 0.9565. 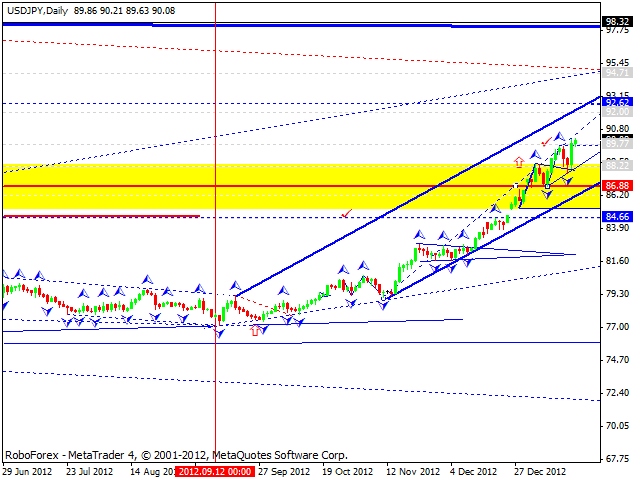 However, if the pair breaks the pattern downwards, it may continue forming this wave and reach the level of 0.8790. At the daily chart the USD/JPY currency pair continues moving inside an ascending channel. As I said earlier, after breaking the level of 84.70, the price is growing up without any serious corrections. This week the pair may continue moving upwards and break the level of 92.30. Later, in my opinion, the price may consolidate for a while and then continue growing up towards the target at 94.70. 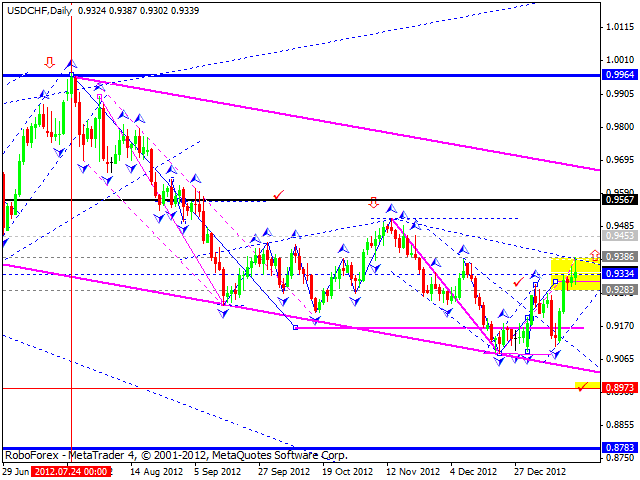 At the daily chart Australia Dollar is being corrected towards the target at 1.0470. 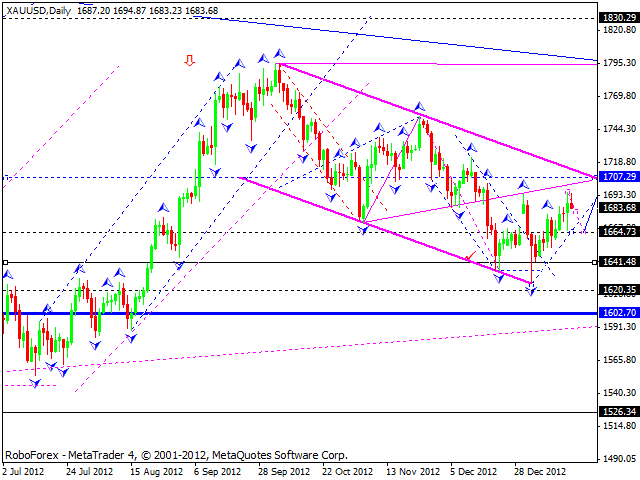 This week the pair may reach this target and then start a new ascending wave towards the level of 1.0650. Later, in my opinion, the price may start one more correction towards the level of 1.0550. 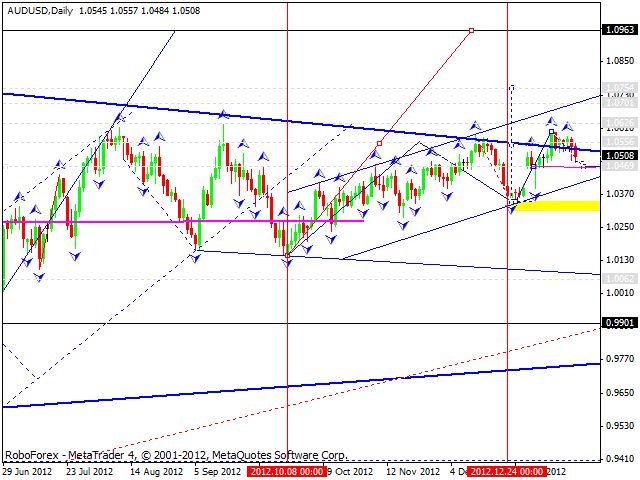 All these movement considered to be inside the same wave with the target at 1.0750. At the daily chart Gold is still being corrected; the target is at the level of 1707. By now the market has already reached a local target of this wave. This week the instrument may form a correction towards the level of 1670 and then start forming a new ascending structure, the fifth one, towards the main target at 1707.